Most dance forms are all about straight, aesthetically-pleasing “lines,” that create the illusion of length from fingertips to toes. One of the most desirable lines is that of the foot. This particular line can be especially difficult to train, but it’s not impossible! We have gathered some tips to help you train those arches to form beautiful lines. Because of the structure of our feet, it’s important to keep the ligaments strong so they can hold your bones together. When we stretch our feet, we want to focus on stretching the muscle without over-stretching the ligaments. Avoid doing stretches that press really hard on the top of the foot and force the foot and ankle into an extreme position. For example, don’t put your feet under anything heavy like the edge of a couch. Be careful when using foot stretching devices. Instead, use balls of various sizes and stiffness to help massage and stretch out various parts of the foot and lower leg. Warm up before stretching, stretch only to the point of tension, and maintain proper alignment the whole time. Exercise to strengthen the foot. Piano toes: Starting with your toes lifted (extended), slowly lower the tows to the ground, one by one, as if playing the piano. Try to use each toe separately, and do it going both directions. Try this exercise seated and standing. Toe spreading: Separate the toes apart from each other and away from the midline of the foot, without flexing or extending the toes. This exercise helps prevent the foot from rotating inwards toward the big toe, which can cause bunions. Shimmy squat: Stand in parallel with both feet in short foot position and toes lifted off the ground and plie into a comfortable position with your knees over your toes. Maintain contact on the floor through the balls of the feet and the heels, shimmy your feet forward one at a time to shuffle forward across the room, maintaining high arches the entire time. Cross train and stay safe. Dancers can perform certain cross-training activities to strengthen your feet.while staying safe. Try syles of yoga that require you to move through various flows to work on strength and endurance of the muscles that control the foot and ankle. You can try running or walking with appropriate shoes and good form. Talk to your trainer or dance instructor about other activities that can help you get stronger while maintaining your safety. Remember to always wear proper footwear in and out of the studio. Choose support over style! 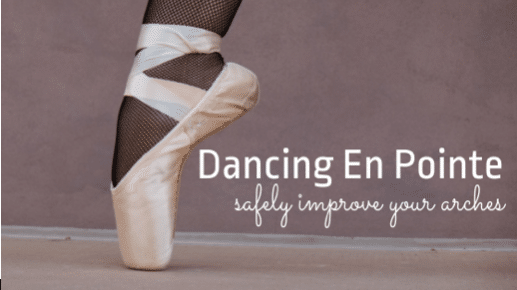 Keeping your feet strong and healthy will help your dancing career soar this year!